If you’ve ever walked into your home and been smacked in the face with a musty or damp odor, there’s a strong chance you have a mold problem somewhere. It can be tricky knowing how to tell if you have mold because you can’t always see it. Mold can hide behind or between walls, in hidden corners of the basement, or behind furniture that lives close to a wall. Identifying a mold problem is important, though, as left untreated it will cause serious damage to walls, wooden frames, and your interiors. It can also seriously affect your health, such as causing chronic headaches or chest problems. If you’re not sure whether you have a mold growth problem, answer these seven questions to decide if you need a mold removal expert to help. These seven warning signs will help you determine whether you have a mold problem. 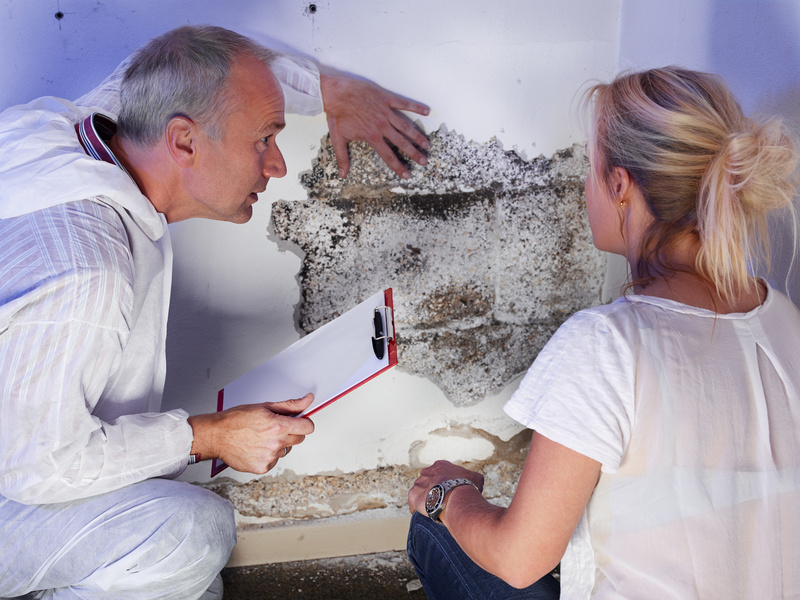 Ask yourself these questions to work out if you need a mold expert to clean your home. 1. Are Your Allergies Playing Up? Do you have a chronic stuffy nose? Is your skin breaking out in rashes? Allergy symptoms caused by mold can range from mild to severe and can appear even when there’s no visible mold. The spores from some mold types can be airborne, which will affect your breathing, irritate your eyes, or give you a ‘stuffed up’ feeling as your sinuses become inflamed. If your symptoms are alleviated with an over-the-counter anti-histamine it’s likely that there is something in your environment causing an allergic reaction. There are other factors to consider, such as a dust allergy, but if you’ve never had this problem before in your home it could be an indicator that you have a mold problem. 2. Is There a Strange Musty Smell? A musty smell isn’t always a sign that you have mold but it can be a good indicator that there is something you need to investigate. If there is a strange smell that’s started to become more apparent in a frequently used room, it could be mold. If your attic or basement has a strong musty smell you should get it checked out, too. These rooms are prone to hiding mold problems that go undiscovered for years. Remember to check your attic and basement at regular intervals through the year for signs of mold. Left unchecked, you may find it spreads without your knowledge until the problem becomes much more expensive! 3. Can You See Grime or Slime? This might sound obvious, but if you can see mold then you’ve got mold. However, it comes in different forms and what you might think is just age-old dirt or a mild case of mildew could indicate the start of a more serious mold problem. If you’re looking how to tell if you have mold, check the corners of rooms and your windowsills for dark spots. There could even be a slight shine to a wall as some mold types feel a bit ‘slimy’ to the touch. 4. Has Your Home Ever Flooded? If you’ve ever had a flood in your home you’re at risk of mold. Even if you thought the floor and walls of your basement or ground floor had fully dried out, mold can be slow-growing over time and thrive behind damp plasterboard or wallpaper. If your home has flooded in the past and you’re now experiencing symptoms of mold, check your house insurance policy. You may be able to have full mold cleaning and repair covered by your insurance, so it’s always worth checking. 5. Do You Get Condensation on Your Windows? Condensation is a sign of too much water in the internal atmosphere of a house. You’ll notice it most on cold days but you can get condensation at any time of year. The most common place to have condensation on the windows is the bathroom. To prevent mold from growing, make sure your bathroom is always well ventilated, especially after taking a shower or bath. You need to install a way for the steam to easily escape and encourage air flow to dry the atmosphere as fast as possible. Too much moisture in the air creates a damp environment over time, and this leads to mold growth. 6. Have You Had a Water Leak? If you’ve ever had a water leak, whether caused by old plumbing or frozen pipes, there’s a chance that you have a mold problem. If you haven’t had a water leak in your home that you’re aware of, but there is a damp and musty smell around areas of water in particular – such as washers, kitchen sinks, and bathrooms – it’s best to investigate for mold. 7. Do You Have a Chronic Cough or Headaches? Mold spores can cause a chronic cough in people who otherwise show no symptoms of allergic reactions. A chronic cough should always be checked out by your physician, but if they can’t find a good reason for your problem the issue could be mold. Black mold is a toxic form of fungus that can also give you headaches, dizziness, or affect your behavior such as shortening your attention span and focus. If you’re experiencing any of these symptoms and your doctor has ruled out more obvious causes, it’s essential to have a mold expert investigate as soon as possible. If you can see mildew or mold on your walls and it appears to only be a small amount (less than a few feet square) try a bleach solution. There are many over-the-counter cleaning products designed to tackle common mold problems in the home, and any of these will do the trick on new mold. If your mold has taken over, or you’re still experiencing symptoms of mold despite no visible evidence left following your bleach treatment, it’s time to call the experts. Mold removal experts are trained in the safest and most effective ways to remove mold from your home for good, which will minimize the possibility of the problem returning. Remember: once you’ve treated your home for mold, put steps in place to prevent recurrence. Make sure areas are well ventilated and consider using a dehumidifier if your home is in a particularly damp environment such as next to a lake. If you’ve answered ‘yes’ to any of the warning signs on how to tell if you have mold, it’s time to ask a mold expert to help. An expert will have access to the best mold-cleaning solutions suitable for your property so you can get your mold problem under control in no time. Contact us today to find out how we can help you get your property clean and mold-free.